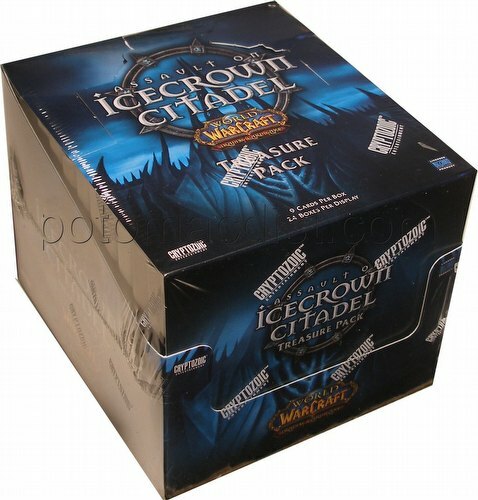 Each $83 box contains 24 packs. Each pack contains 9 cards. Each Assault on Icecrown Citadel Treasure Pack box contains 24 packs. Each pack contains 9 cards. There are 30 all-new gameplay cards in the set (10 epic, 20 rare). There are new allies, equipment, quests, and abilities, as well as new ability art for Highlord Tirion Fordring, Lady Jaina Proudmoore, and lady Sylvanas. Epic NPC allies include Muradin Bronzebeard, High Overlord Saurfang, and Highlord Tirion Fordring. Players can also look for the legendary axe, Shadowmourne.